16km from motorway - easy access. 20 min. from major tourist destinations: Grignan, Nyons, Vaison-la-Romaine. La Perdiguiero is a charming holiday home for 6 to 12 people. 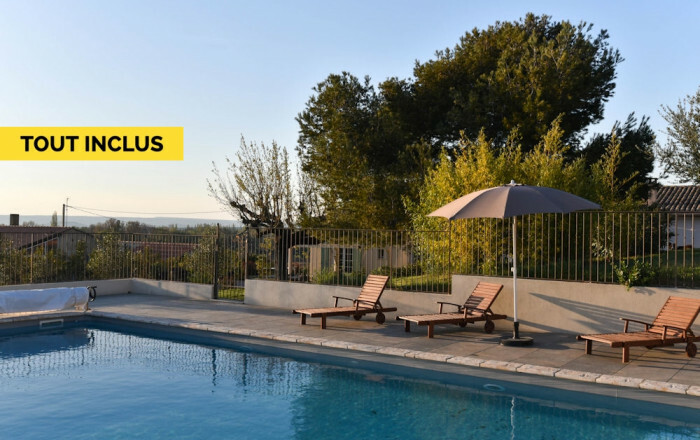 Located in the southern DrÃ´me, close to the Vaucluse department - ideal for enjoying the delights of the DrÃ´me ProvenÃ§ale and the Vaucluse in both summer and winter. For a short stay, holiday or weekend break, with family, friends or on business, you are sure to appreciate the gÃ®te's top quality facilities (indoors and out) as well as the wonderful scenery of this lovely region. La Perdiguiero has been recently totally renovated, retaining all of its period charm. Ground floor: lovely, light & airy living room and kitchen, 3 air-conditioned bedrooms - 2 with en-suite shower room (twin 80x200cm beds OR queen-size bed) (twin 80x200cm beds OR queen-size bed) (double bed), bathroom (bath & sauna), 2 separate WCs with wash-hand basins. 1st floor: large attic bedroom for 6 people with small lounge area (books, lots of children's games). Table tennis table, trampoline, swing, 2 boules pitches. Swimming pool (6x12m) shared with owners, open April to November.